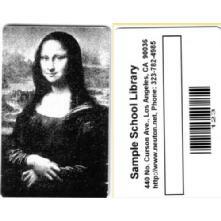 Neuton Data Systems - School Library Automation - Card 201 - Mona Lisa - 100 Cards . Black and White, two sided cards - full image on one side and library information signature box and barcode on reverse Only 31 cents per card + shipping - NO SETUP CHARGES (sold in multiples of 100 cards) Black and White, two sided cards - full image of Mona Lisa on one side and library information signature box and barcode on reverse. 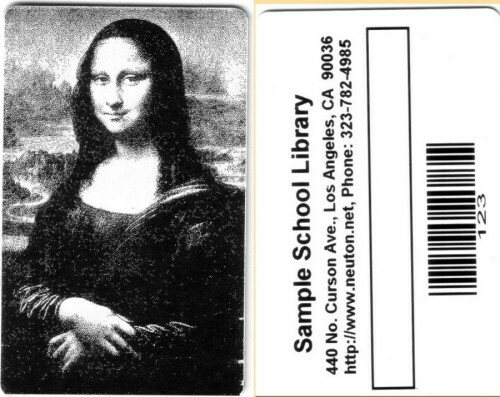 Beautiful Mona Lisa on Library Card. NO SETUP FEE FOR TEMPLATE CARDS. We Do NOT charge extra for Barcode printing, that is included for FREE!